Pro-tek rear sprockets are�completely constructed on precision CNC machines from 7075 T6 aerospace quality aluminum. �We do not gear hob the teeth.� This maintains concentricity with the hub diameter�since both are cut at the same time.�The teeth are machined to above the latest industry standards creating an accurate tooth profile that fits precisely on the chain rollers. This insures maximum chain and sprocket longevity and a more efficient power transmission. We then increase durability by brite-dip anodizing each sprocket in a black or clear finish�for protection from corrosion. 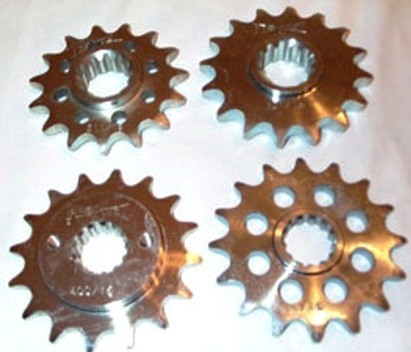 Our�front sprockets are also completely CNC machined to exact tolerances�from 4140 nickel-chromoly steel resulting in a quality product.None of our front sprockets are gear hobbed either, but we do lighten them with drilled holes to save on rotating mass. Every lb of rotating mass equates to a 4 lb weight reduction.�The sprockets are then�case hardened�to Rc 58-60 and�finished with a�zinc plating for added durability and protection from corrosion.